Product may from differ image displayed. 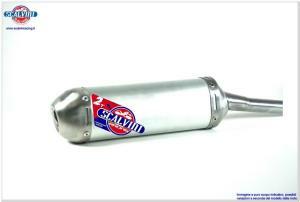 Standard Silencer for two strokes engine, in aluminium with inox cap .TM 250-300 ('08/'14). Aluminium silencer with inox cap, light but strong, the standard silencer offer you the best price with the best strenghtness. Every part of it show the passion and the experience of a team directly involved in the professional competitions world. Body lenght 320mm.